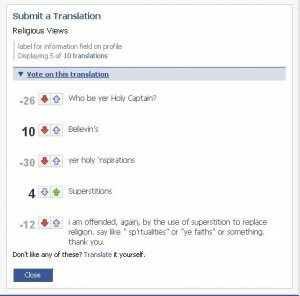 Facebook is available in Pirate English, as all good FSM fearing people know. What really impressed me is that “religious beliefs” translates as “Superstitions”. Hell yeah. Well, it did. Some suckers got all offended and has voted to change it to “believin’s”. What you should do next time you’re on is go to settings -> Language and switch to “English (Pirate) BETA”, and then turn on the inline translator(the little blue globe in the bottom right) and vote up the proper translation. Now Avast ye Terahertz Hoards! I actually did *not* know about Pirate English translation until now! Superstitions is +8, believin’s is -4, perhaps Facebook be a wussin out to not offend the sensitive types.